Being organized has never, ever in my life been something I've been good at. Unfortunately, if I was one of those naturally organized people (like my husband- sigh), I think my life would be easier as a teacher. There are so many things to keep track of as a teacher, and organization has probably been my biggest challenge as a new teacher. Last year, I was an interventionist, which meant I was an assistant teacher but not fully in charge of the class myself. A desk calendar worked well for me. Now that I was the sole teacher, my desk calendar was always covered. It just wasn't working for me. 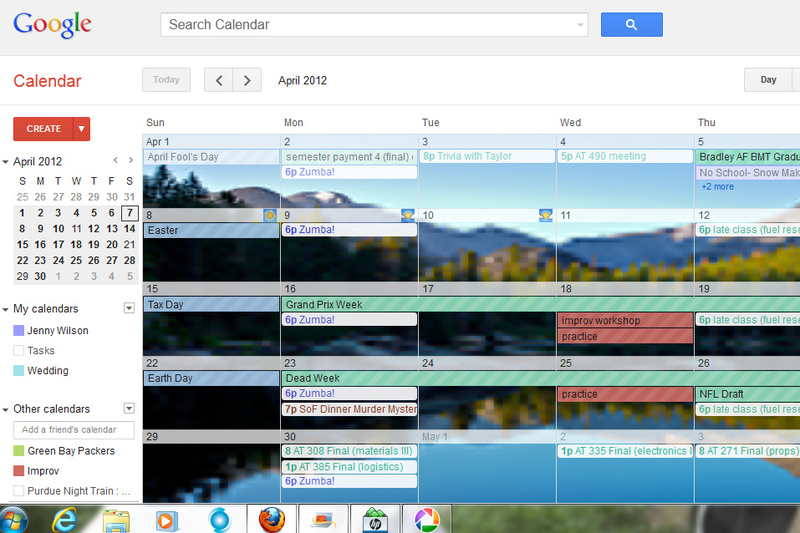 I tried just using Google Calendar for awhile. 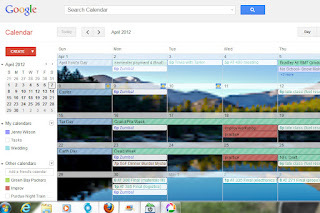 I do love Google Calendar- especially because my husband and I can each have our own calendars and they sync up both at work and at home- but I would go to a staff meeting and write down dates with the intention of adding them to Google Calendar later, and never do it. Then, I happened across Leslie from KindergartenWorks talking about her teacher binder. I already kept my plans in a small binder, which worked for me, and the thought of putting my calendar and lots more all in the same place made a lot of sense. Click on the picture to see her ideas and awesome freebies for in a binder! I was still figuring out how to make the binder work for me, when I saw another post, this time at Ladybug's Teacher Files, about fixing up her teacher binder. Click the photo to go to Teaching, it Keeps Life Fun! I still had to figure out what my tabs should be, so I looked at binders from Teaching, it keeps life fun :) and Tales of a Teacherista. Finally, I felt like I knew what I needed. This photo is linked to the original at Tales of a Teacherista. My suggestion is to think about what things you need with you on the go, or things you need to get better organized, and go with those. I started out using things I already had, in case a binder didn't really work for me. So, without further ado... take a peek inside my teacher binder! First of all, the front cover. I had an old blue binder, and I wanted to use that because of the color. (I know, it seems silly, but if I like looking at it more, I'm more likely to use it and keep it somewhat organized!) Unfortunately, the plastic pocket on the front was partly torn, but I used it to my advantage, and now that side holds Post-Its! I also have a free Shutterfly yearly calendar that I slid inside, a few extra paper clips (because I know I'll need them), and usually a class list with classroom numbers on the cover (not pictured). I know it's probably a Teacher-Blogger Crime, but it doesn't have an adorable cover. The bright colors are good enough for me, though! 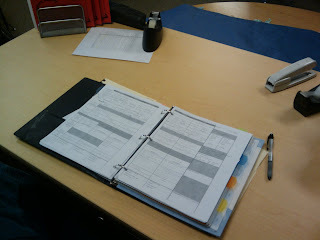 When I first open the binder, my plans open. Somewhere I read the tip of using a binder clip to make this happen, and I love it. I use a binder clip attached to the calendar tab, too, so that the tab opens right to the current month. I will be posting more about my planning pages soon! Then I get to the dividers. I think I got these at Wal-Mart? They are "erasable" and have pockets on each divider. I used a fine print Sharpie on them and I'll just use nail polish remover to erase later if needed. The first tab is the calendar, because I'm using it constantly. In the pocket, I have our curriculum calendar. One of my awesome co-workers made this giant table that tells me each week what our reading story, vocabulary words, spelling lists, language arts focuses, etc. are. Having all of that information in place makes planning and writing my newsletter a million times easier. The yearbook company or someone gave these out for teachers at the beginning of the year, so I tore it out and stuck it in behind the divider. If you need a printable one, though, check out some of the links above for cute calendars! Next up is Reference. This is a catch-all category for schedules, IEP/ ILP summaries, usernames and passwords for students, the staff phone tree... anything I might need to reference quickly! After that comes Student Data. I add to it throughout the year with anecdotal notes, test scores, and more. Usually, I have a list of my kids' DIBELS ORF scores in the divider pocket, since I reference those all the time to make reading groups. Sometimes I make my own tables to keep track of specifics, too (in this case, each area of our unit test). The next divider is Standards. At the beginning of the year, I wrote out a lot of lists while I was looking at when they were covered. Next year, this will probably be a typed list of Common Core standards! The last divider is an archive. On one side, I keep copies of my old newsletters/ parent letters. On the other side, I keep an archive of my lesson plan pages so far. After that, I keep my meeting notes. They don't get their own tab, but that's okay by me because I'm not using them daily. I used another kind of tab (smaller, so they don't stick out until I turn to this section) to divide notes depending on the type of meeting (all staff, grade level, RTI, special groups). Behind that, I keep two file folders. One is for copies that need to be made, and the red one holds a few discipline notices. I take my binder with me whenever our class goes somewhere else, like the computer lab or large group instruction room, and it's good to have a few discipline notices always with me, juuuust in case. In the back pocket of the binder, I put things that I need to send home, reminders to parents or extra field trip forms. Finally, the back cover of the binder holds our current newsletter. It has the spelling words (both lists), vocabulary words, and what we're working on in each subject, as well as a parent letter on the back. It's easy to scoop up and use to give a spelling test or reference while I'm planning. So there's my all-in-one teacher binder/ organizer. 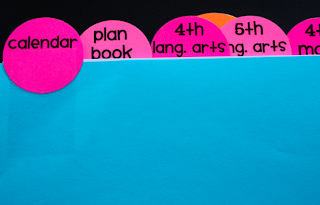 As an organizationally-challenged teacher, this thing helps me keep it all together! For new teachers, especially, I definitely recommend using something like this. What's the one thing that keeps YOU organized? What an awesome post! I'm featuring it on Bagels and Blogs tomorrow. Fantastic! Thanks for the show and tell. I LOVE your teaching binder! Thank you so much for sharing your ideas! I'm just finding your blog and have been reading it all morning. I have had a teaching binder in the past, but I love everything you have in it. I think I am definately going to be reorganizing my binder/ adding to it very soon for next year. Thank you for sharing. This is amazing! I am so doing this. I already have a binder but this is the ultimate in keeping it all together. So Nicely organized. Love it! as a very old, new teacher, I appreciate this post more than you can possibly know. I know all the thing that coulda/shoulda/woulda be in there, but you gave me great insight as to what I will be happy i planned to have in there and how to arrange it in an organized fashion. Thanks!! who is becoming paralyzed by the size of her to-do list!! I have a five-star notebook and a 12-month stapled planner that I carry around with me all the time. The notebook was inspired by interactive notebooks that many teachers use now, but this one is for me. I tape in anything I need all the time, like the school calendar, class schedule, standards, and many other things I need to reference often. I use the paper in it to take notes at meetings and make to-do lists or plan lessons. The calendar I slide into the front, and I put important papers in the front or back. I carry it with me everywhere. Thanks for the shout out - it's great to see you newer, revamped one too. This is a total Game Changer!!! Thank you. Wow. Thanks so much for helping a girl out. I have been at this crazy, beautiful thing they call teaching for two years now, but my plans still resemble "fly-by-the-seat-of-your-pants" much more than "cool, calm, and collected." I think this method of binder-ing will help me get my very unorganized brain in a place where it can have a place for everything and everything in its place, which will greatly benefit my kids! That's definitely me! A binder helped me a lot. It still didn't fix everything (helloooo, procrastination!) but it helped me be able to find the important things! Hope it helps you too! Thank you so much for sharing! This is exactly what I was looking for! Love how you broke it down step by step! Songs to Remember Measurement Conversions! Didn't Win the Giveaway? Freebie for Everyone! Lesson Planning, My Way- and a *Custom* Giveaway! Building Your Classroom Library- Cheaply!